Tomatoes and I have come a long way. I did not like tomatoes my whole childhood, even throughout high school. Actually, it wasn't until about 5 years ago I started eating them, and became obsessed. I don't even know what happened. I couldn't even eat a burger with one, and my plates were always spotless except for those red darn tomoatoes I couldn't get myself to eat. And then one day I went to a restaurant and tasted a tomato salad. And something so glorious was happening inside my mouth, I almost couldn't comprehend it. The burst of sweet and savory in this small juicy fruit over took me. I craved it. And at 22, I became a tomato person. I eat them as snacks, I always want to incorport them in dinners, and if I could I would swear the sweet sent. Although Method did come out with a tomato vine hand soap last year, so I did smell like tomato! I got so very inspired with tomatoes that I thought the beautiful color would makes a great hue to decorate with in the house. 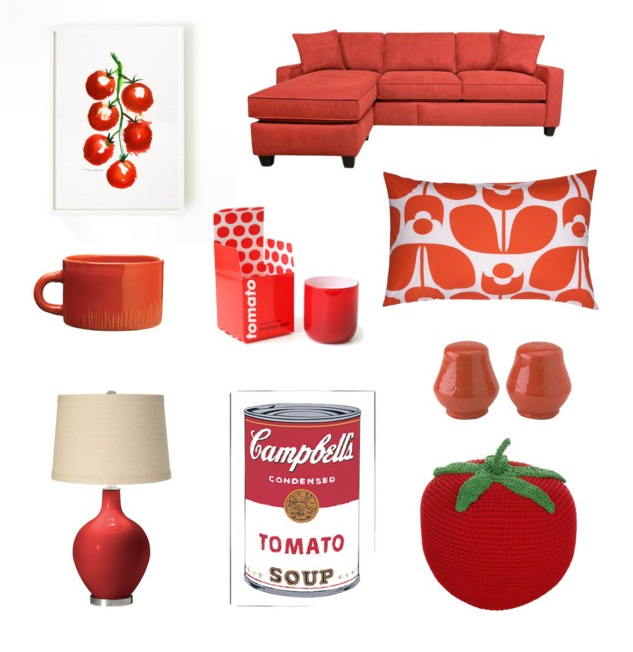 Here are some home decor ideas inspired by the delicious red tomato! I love a bold lamp, so a nice clean round red base is perfect to add a tomato touch. Orla Kiely does everything right. The color and pattern of the pillow is perfection. Pretty salt & pepper shakers are a must in the kitchen. This cappuccino mug is perfect for my morning routines. And I think it would actually work too for some tomato soup. Holy Cow! Can you believe how awesome this tomato pouf is? I want one in every room of my house! Jonathan Adler can do no wrong. I love all his corky home decor. I especially love this tomato candle! I need this watercolor painting from Etsy. It's so lovely and simple. I can see this in my dining room. This sofa is sooooo fun! This sure is a statement piece but it would look so cool in a living space! I'm so very inspired...and hungry!